I spend a lot of time in the Triage. More and more I am seeing questions that are in a different language, I have been flagging these questions as "off topic/unclear what you are asking" and leaving a comment telling the user to re-ask the question on the respective Stack Overflow website for their language. I was wondering why there is not an option to mark the question as belonging on a Stack Overflow in a different language like you can do if the question belongs on Super User or Cross Validated? Side question: is that the correct way to flag a question that is in a different language? You're doing it right; flagging as "unclear what you're asking" is the right action. Don't (Google) translate the post into English; the author might not speak English at all. Leaving a comment is a good course of action as well. One of the first rules of migration is "don't migrate crap". In a foreign language, it's hard to determine whether a question is good enough. For example, something that looks like a well-worded question in Spanish could actually be 'just' a problem caused by a typographical error. Therefore, there's a policy in place that questions (usually) aren't migrated between different Stack Overflow sites, not even by ♦ moderators. 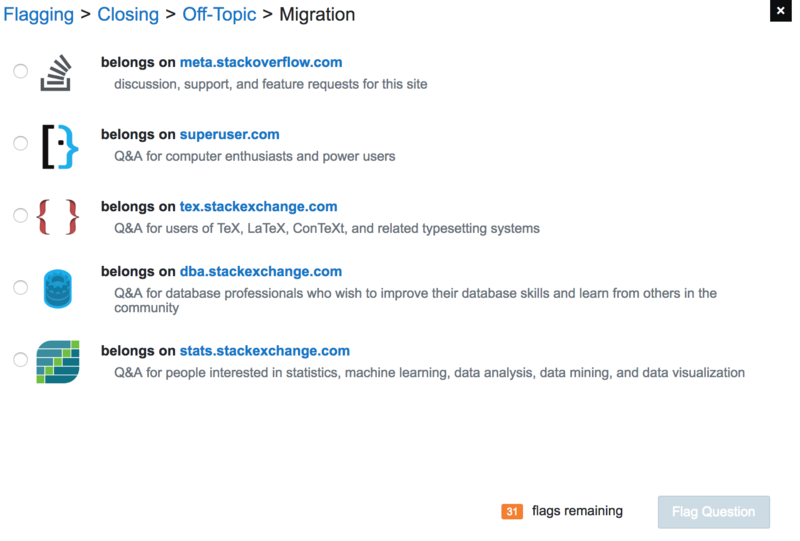 That aside, there have been various requests to extend the list of migration targets, mostly on Meta Stack Overflow (example). They've all been declined (so far). Not the answer you're looking for? Browse other questions tagged discussion review flags migration languages . Why was this question closed as off-topic without being migrated?